Oh it's Valentine's time all right, it's red and hearts everywhere, in every form. Including macarons. 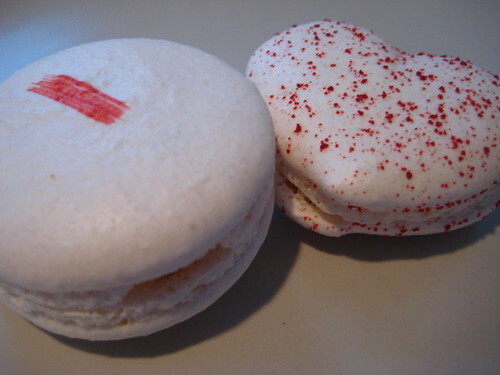 Didn't think you could make a heart-shaped macaron? I bet you also don't think you can make a cookie eclair. Chika Tillman wanted to, so she did. Chika Tillman is quite possibly one of the best pastry chefs in New York, and her spots, Chikalicious Dessert Bar (the fancy one) and Dessert Club (the bakery) are high on my personal favorites list. The last few times I was around their way, I didn't have the chance to stop by, but recently an opportunity did arise and I was amply rewarded. First, they've begun making cookie eclairs. The 'cookie' aspect translates to a layer of crunchy choux pastry. 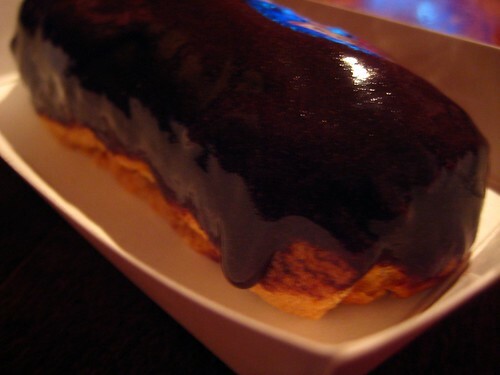 I am not aware of how exactly this is achieved, but the result is perfect-a crunchy dessert eclair. Dessert Club is filling them to order with your choice of custard-I obviously went with chocolate. Silky custard filling, crunchy shell, covered in rich, dark chocolate. It's like if the most perfect chewy with crunchy circumference chocolate chip cookie decided it wanted to become an eclair, this is what it would be. She's also branching out to macarons. I don't think I'd ever had one before, at least there is no photo evidence to such. I had to get one of the hearts, how could I not! It's adorable with its red flecks. The flavor is rose, and I didn't get to taste it. Instead I allowed a friend to try-sharing is caring-and he thought it was awesome. I did take the strawberry all for myself, and these are some pretty impressive macarons. Smooth, flat, crunchy shells; moist, chewy interiors, and deliciously creamy filling. The strawberry taste came through, but wasn't overwhelming or chemically. Jackpot. I'll be back soon, especially to try the two new cupcake flavors I spied, strawberry and blueberry. 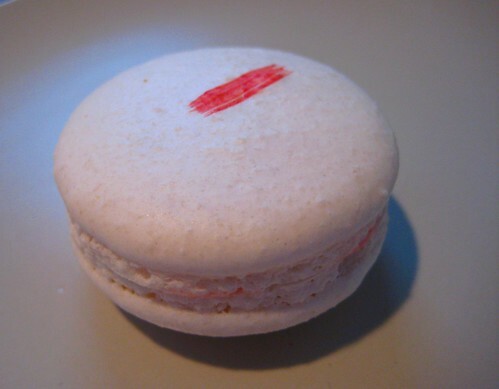 I had one of their salted caramel macarons this past summer - fairly plain-looking with uncolored shells, but REALLY delicious. I love Chikalicious. I just went there myself for one of their awesome sundaes the other day but didn't see the eclair you talked about. I need to go back for that! 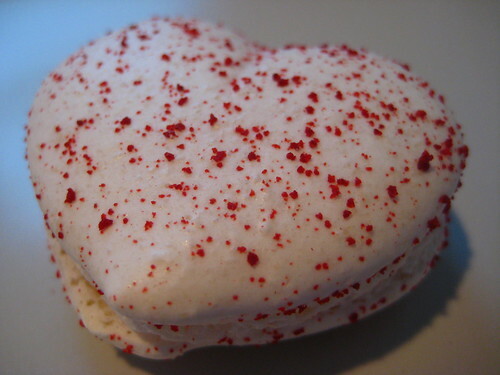 Wow heart shaped macarons - damn, never have seen those either! I love the simplistic design of these desserts. Elementary yet elegant.